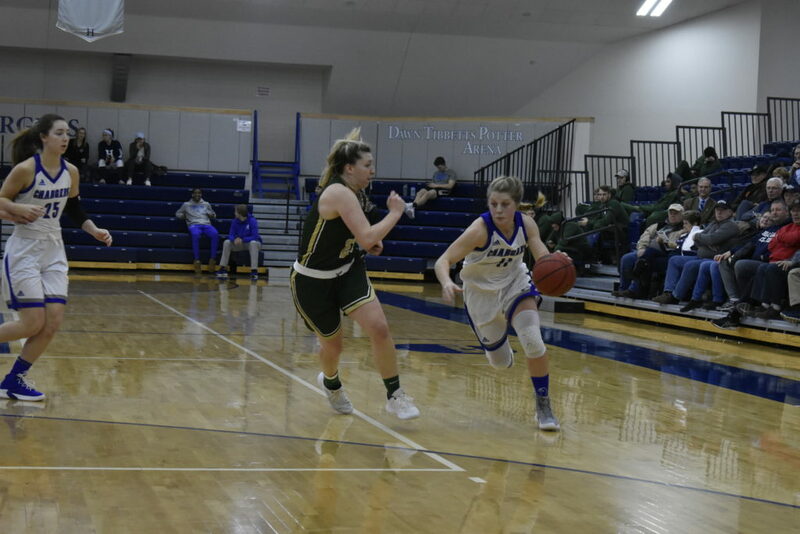 The Hillsdale College Chargers turned their four-game losing streak around in a big way with a pair of wins against Tiffin Uni­versity and Cedarville Uni­versity on Thursday and Sat­urday. In the two vic­tories, senior guard Allie Dewire scored a com­bined 57 points, earning her the G-MAC Player of the Week award. On Thursday, the Chargers defeated Tiffin, 90 – 72, to halt a four-game losing streak. Dewire scored a career-high 33 points, making nine of 11 shots from the floor and 15 of 18 free throws. She also grabbed 12 rebounds, tying a per­sonal season-high. The per­for­mance was her third double-double of the season. Dewire got to the free throw line over and over again thanks to her will­ingness to drive into traffic and draw contact on her shots. The Chargers, plagued by slow starts during the recent stretch of losses, jumped out to a 31 – 15 lead by the end of the first quarter. As a team, Hillsdale shot 62.1 percent from the floor and made seven of nine threes in the first half. “I thought we got really quality looks because they moved them­selves and the ball so well,” Fritsche said. Tiffin’s only lead of the night was 3 – 2, and it van­ished just 52 seconds into the game. From there, the Chargers took the lead, built on it, and didn’t look back. Hillsdale led by more than 10 points during the final 32 minutes of reg­u­lation. Senior forward Makenna Ott added 16 points, and senior forward Brittany Gray and freshman guard Lauren Daf­fenberg each scored 11 in the win. On Sat­urday, Cedarville visited Dawn Tib­betts Potter Arena for the first time this season. The Yellow Jackets began the day five games ahead of Hillsdale in the G-MAC con­ference standings as one of the conference’s best teams. They left Hillsdale just four games ahead of the Chargers, thanks in large part to more of the same from Dewire. Dewire scored 24 points in a 72 – 66 win, making seven of 11 shots from the floor and 10 of 12 free throws. The Chargers again ben­e­fitted from a hot start, outscoring Cedarville 21 – 10 in the first quarter. Once the Yellow Jackets switched from a man-to-man scheme to a zone defense, Hillsdale’s scoring success slowed down a bit. The Chargers’ defense played well the entire afternoon, but the Yellow Jackets held a 48 – 45 lead entering the fourth quarter. That’s when Hillsdale’s offense came back alive, and the Chargers outscored Cedarville 27 – 18 in the final quarter to seal the victory. Gray scored 16 points and grabbed seven rebounds, while Ott scored 11 points and grabbed nine rebounds. Gray is now 11th in the G-MAC in points per game with 13, while Ott is 14th with 12.5. After aver­aging 28.5 points per game in the last two wins, Dewire is fourth in the con­ference with 14.8 points per game. The win against Cedarville is Hillsdale’s first this season against a team ahead of them in the G-MAC standings. The Chargers will have more oppor­tu­nities to knock off higher-ranked teams than them­selves, beginning on Sat­urday when they host the Uni­versity of Findlay. Hillsdale lost to Findlay on the road just three weeks ago, 69 – 64, on Jan. 19. Fritsche said the team’s two wins last week were a result of a process of hard work and ded­i­cation to improvement from his players, but finally seeing the final score in their favor will add even more to their con­fi­dence. Saturday’s tip-off against Findlay is at 1 p.m. The Cedarville win was the most com­plete game I have seen the Lady Chargers play this season. They were good with the ball and on Defense. It really was a stellar win and it shows what they can accom­plish when they focus on playing strong Defense. If they can bring that effort into every game from now on they can get back into a position to vie for the GMAC cham­pi­onship, not a doubt in my mind about that.